WORK with a TOP player & coach in DC today! "Since getting David as his coach in January '16, Adamson has gone from a preliminary rating of 440 to over 1000 in less than 6 months, and to over 1600 within a year, winning the 2016 USCF Junior Grand Prix. David is an awesome coach and a really nice guy. Cannot recommend him enough!" ﻿Welcome! My name is David Bennett. I am a United States National Master and international Candidate Master of chess and absolutely love everything about the Royal Game. Just as I put everything I've got into every chess match, I give my all during each moment with my students, dynamically tailoring my instruction to meet the unique needs of each of my students. It brings me great joy to help my students achieve victories -- whether that means an "aha!" moment of understanding, winning a tournament, or improving your executive decision-making skills. I enjoy working with people of all ages and skill levels and with a diverse array of goals. My students will tell you that I bring a great deal of passion and energy to each lesson; I want to share everything I know with my students. I truly want to see my students achieve their goals. Inquire about lessons here. Shoot me an email to inquire about convenient lessons in your DC area community or online! I am an actively competing National Master & International (FIDE) titled Candidate Master, currently ranked #3 in Washington, D.C. and top 1% in nation (USCF 2246, Oct. 2017). 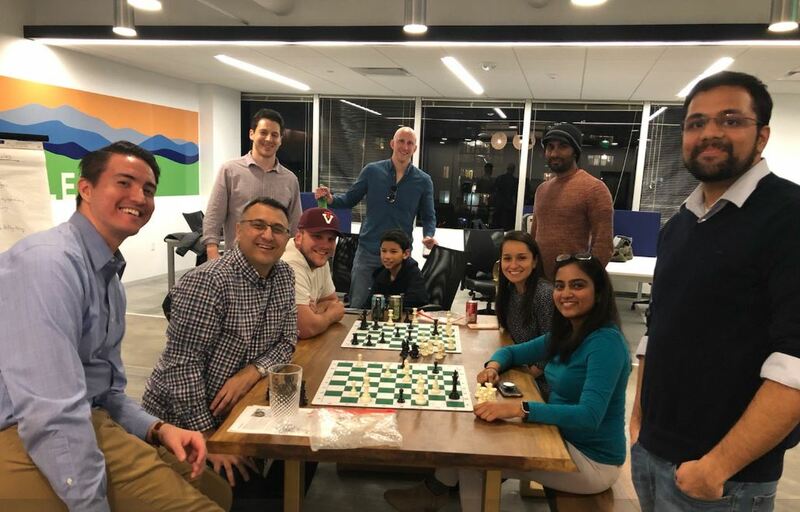 I have experience as a professional scholastic coach with Silver Knights Chess (teaching chess in schools throughout DC and northern Virginia) and as an independent coach with four schools in DC and dozens of private students. I have coached players ranging from ages 4 to 82 and welcome students of all age and experience levels. I am VIRTUS certified, which entails a rigorous background check and training to ensure a safe environment for all. I've also completed the Stewards of Children and DC Mandated Reporter Trainings. I strive to teach my students important life lessons from chess. including grit, good sportsmanship, strategic planning, analytical decision-making, resilience, open-mindedness, objectivity, sound judgment, lucid visualization, and more, leading to heightened self-esteem. I think the ability to react productively to a loss and to see things from a "10,000 foot view" is very important. I feel that my steadfast commitment to these areas sets me apart from many coaches. A Los Angeles native, DC has been my home since 2013. Read more about my journey, in chess and in life, here. I hold bachelor's degrees in history and political science (U of Michigan), and master's degrees in public admin. and urban planning (USC). I am committed to Social Impact and Affordability, making the benefits of chess accessible to all. See my Community Impact work (100+ hours per year). I take a holistic approach focused on developing a mastery of positional/strategic play and deep planning, teaching you to effectively dissect any position to find the move that the board calls for. I can assist you in thoroughly analyzing your games so that you can get to the bottom of your strengths and weaknesses. Then, I will work with you to develop a concrete plan to eliminate your weaknesses and fortify your strengths. After taking lessons with me, you should have the tools you need to effectively analyze games on your own, too. A typical lesson includes tactical puzzle warm-ups (internalizing effective methods to unveil powerful sequences of moves), positional/strategic training to ensure a well-rounded player, learning fundamental endgame theory, in-depth game analysis, and some fun sparring with me (accompanied by analysis, helping my students to develop a structured thinking process that works for them). 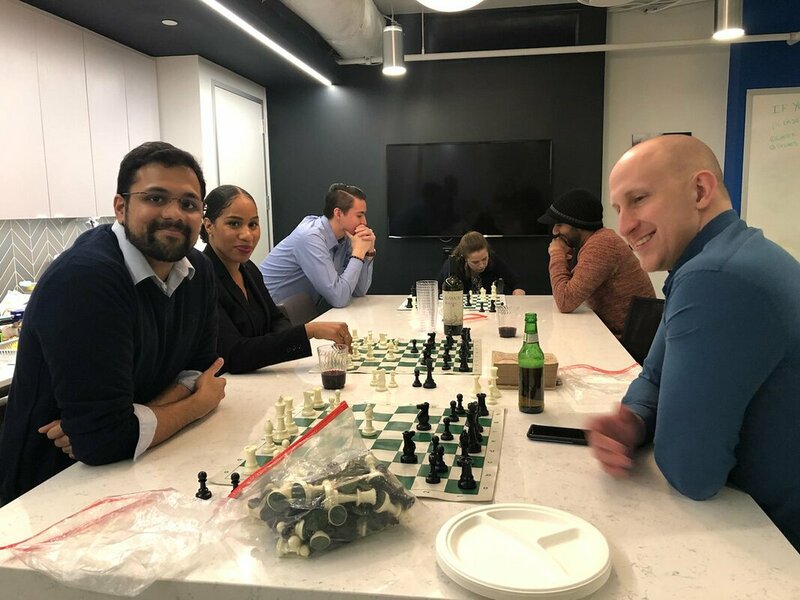 I am a big fan of learning from the greats -- the World Champions such as Lasker, Capablanca, Tal, Alekhine, Fischer, Karpov, Kasparov, Anand, Carlsen, Hou, the Polgar sisters, etc. -- by studying classic games for pattern recognition and gaining a deeper appreciation of the Royal Game. Of course, the focus will differ from student to student, as I believe in carefully listening and responding to my students' needs/goals, rather than "one-size-fits-all" approaches. With more and more chess players blindly following the suggestions of computers, I believe that it is now more important than ever to develop independent, creative, critical thinking skills -- understanding not just what a good move is but why it's a good move and how it fits into the big picture. Through my lessons, I hope to cultivate independent-minded students who are confident in their own decision making process/judgment and do not feel the need to become over-reliant on computers. We will develop those skills together. I am very patient and 100% dedicated to your success. Whatever your goals, we will achieve them together! or check out my bl﻿og, endorsements & Facebook page. Live outside DC? Not a problem - we can meet at a coffee shop, library, etc. that is convenient for you. Once we know each other, we can always meet in the comfort of your own home as well. Prefer instruction in Spanish? Todo bien, hablo Español. Check out my August 2018Washington Post feature here. Interested in trying a lesson? Have a question or comment? Shoot me a message here. 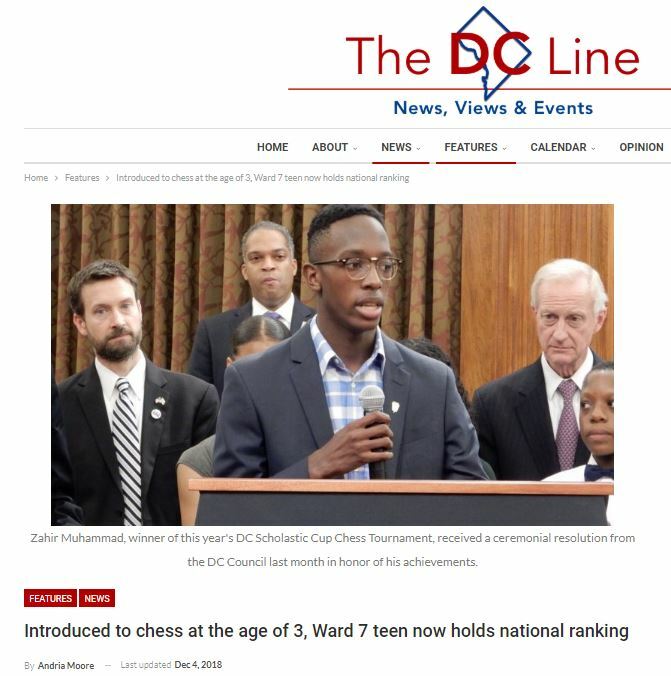 My student Zahir won the DC state championship in 2018, after which he traveled to Wisconsin to represent DC in the Denker Tournament of High School Champions. 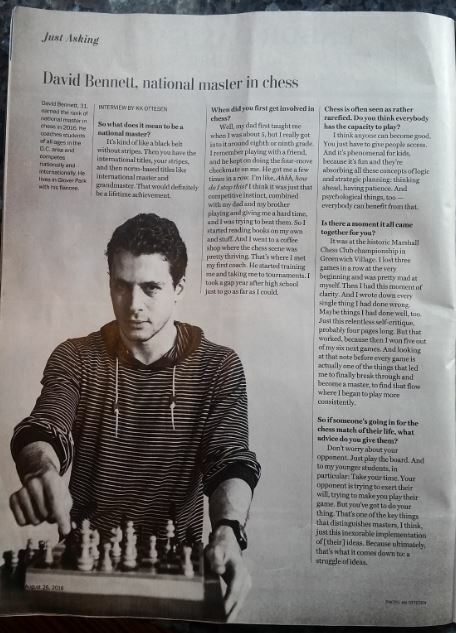 The embedded article on his path to chess success is excellent. A clip from my new YouTube channel, "Chess on the Brain," where one of the things I've focused on is providing free, in-depth analysis of viewers' games. I also enjoy playing and describing how to win Chess 960/Fischer Random Chess games, which feature 960 different randomized starting positions. I share my thoughts on chess improvement, showcase my students' achievements, provide updates on my chess tournaments and travels (most recently to Bhopal, Mumbai, Kochi, and rural India with the Guinness Record holder GM Timur "Blindfold King" Gareyev), and engage in discussions on all things chess/news on my Twitter page @chessprof. Join the discussion. 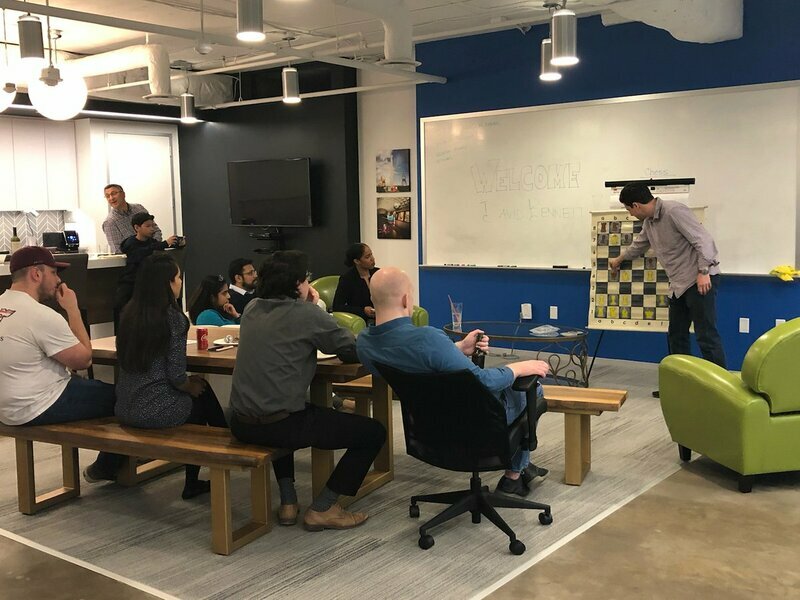 A recent event where I taught chess at the tech company VerticalApps. I also teach military families with Blue Star Families on Fort Belvoir twice a month and at the Military Starbucks in Alexandria, in addition to volunteering weekly at Francis Gregory Library (join me and the tough competition 6:45pm Wednesdays) in SE DC and Chess Girls DC. I enjoy teaching a broad array of students from all walks of life. Let me know if you'd like me to teach at your organization to challenge your team's minds at work or during happy hour.